A view of the green on the ninth hole at Belvedere. Belvedere Golf Club in Charlevoix, Michigan, dates to 1927 and is consistently ranked among the top courses in Michigan. 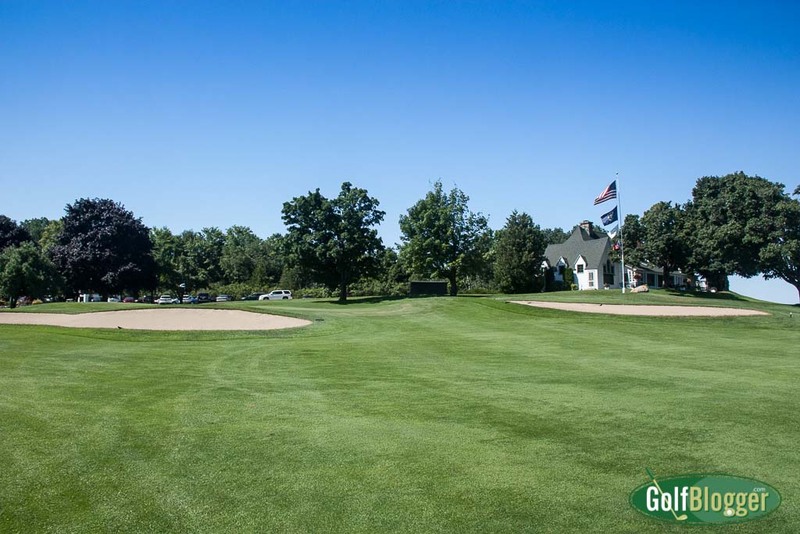 I thought Belvedere was fun and charming, but wouldn’t put it on my list of Top Ten public access golf courses in Michigan. Top twenty, yes. Belvedere was designed by William Watson, who is perhaps better known as the architect of Interlachen in Minneapolis, Harding Park, and the Olympic Club in San Francisco. 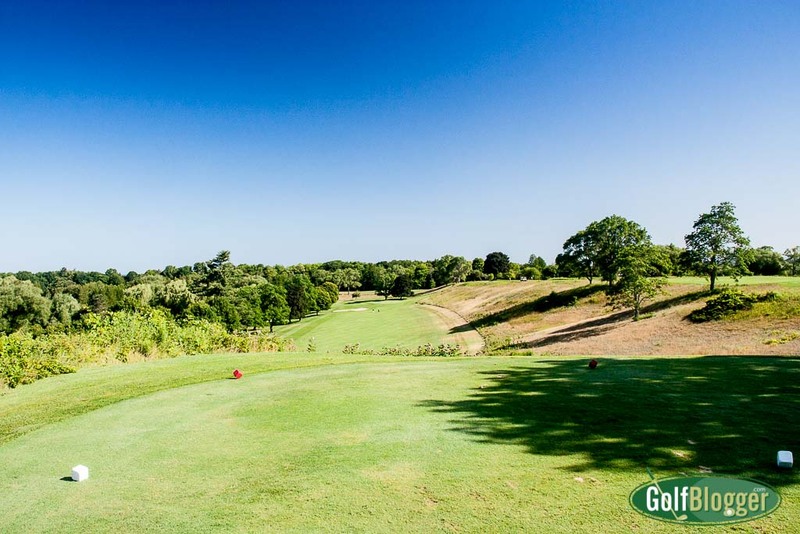 Given the pedigree, it should come as no surprise that the course features a relatively straightforward layout, with plenty of adjacent, tight fairways and small crowned greens. Like many northern Michigan courses, Belevedere is hilly. Most of the holes offer elevation changes ranging from mild to significant. Even on the half-dozen flat holes, though, the greens are elevated. While most of the holes are straight shots, Belvedere has two doglegs right, and two left. Fairway bunkers on the edges of eight of the holes are placed to catch the unwary and the inaccurate. The first hole at Belvedere is a 370 yard downhill par 4. Belvedere’s first hole is fun. It’s a dizzying downhill shot from the teebox to a sloping fairway guarded on the right by a hillside. The next shot is back up to an elevated green that makes the ball roll off in all directions. I hit the front quadrant of the green and watched my ball roll down the hill. The chip back up barely held. That was the warning shot for a lesson I would learn painfully over the next few holes. It’s hard to hold the greens, and if you’re in the wrong spot, hard to putt the ball into the hole. There are ridges and bumps on many of the greens that divide it into puttable sections. I struggled for several holes. Finally, I resolved the issue by targeting a spot short of the green, hoping that the ball would lose forward momentum as it kicked up. At worse, I could putt or chip up. Several of the holes, however, had significantly elevated greens, requiring me to try to lob the shot in with a longer iron than I really cared to use. The interest in Belvedere’s design is therefore in the approach shots and the short game. 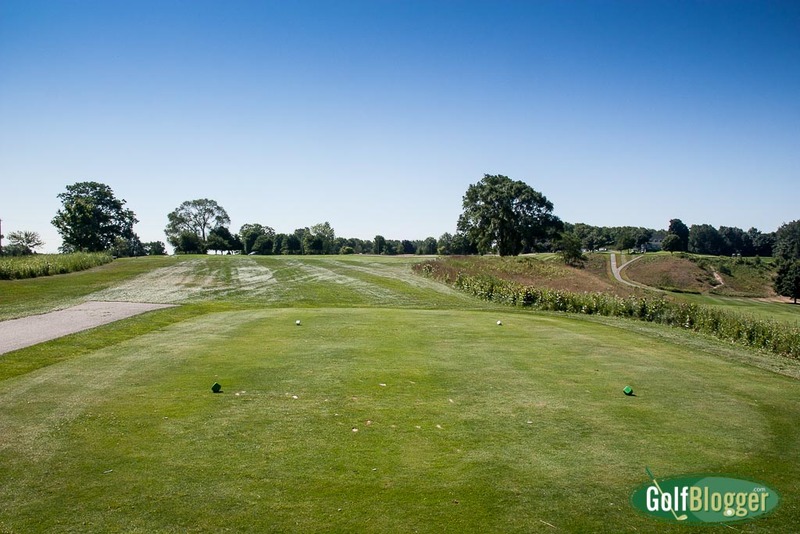 Otherwise, it’s a relatively straightforward design where the main strategy is to hit the ball as far as possible so that you can use as short an iron as possible to hold the greens. Shots coming in on too low a trajectory, with not enough spin would simply roll off into collection areas or into a trap. The greens are Belvedere’s main defense. From the tips, Belvedere stretches to 6,943 and plays to a 73.7/134. The middle of five tees measures 6,281 and plays to a 70.5/125. I strongly suggest that players tee it forward, as long shots into the green are going to result in a lot of extra short game challenges. Belvedere Ninth Hole, a 486 yard par 5. My favorite hole was the par five ninth (above, and top of page). From the tee, players have a decision to make: try to clear the bunker complex right or swing left to the open landing zone. The former offers a shorter path; the latter is more safe. The second shot needs to put the ball in a position for a high lob onto the green. 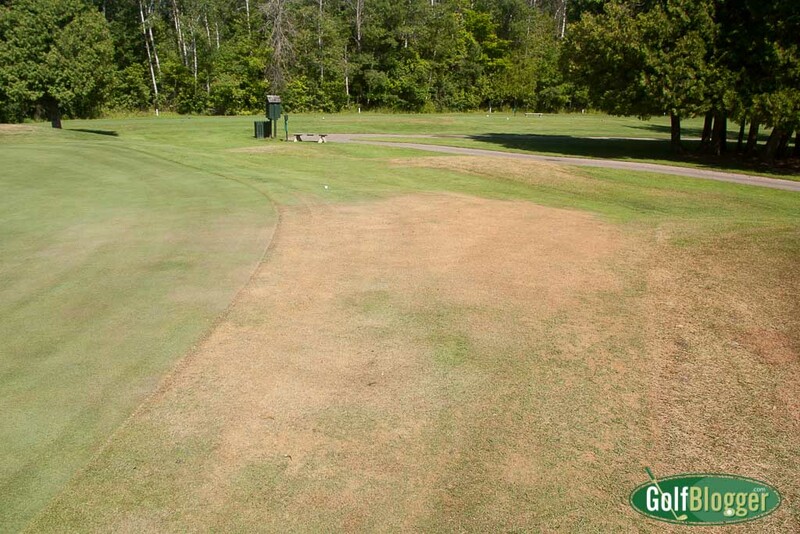 Burned out areas around a green at Belvedere. Conditions on the day I played were good but not great. My thought is that a course that bills itself as one of the top courses in Michigan, or that charges premium prices should at least have consistent conditions. If the superintendent decides to go “natural” and let it brown out, that’s fine. And if they decide to keep it lush and green, that’s also good. But having the course green in some areas and dead in others tells me that they’re struggling to maintain conditions. Belvedere was for the most part green, but was also marked by some jarring dead areas. One nice touch is that the bridges over the creek had ball retrievers in racks on the rails. No need to bring your own (not that the creek was particularly wide). A round at Belvedere is $79 and $20 more for a car rental. That puts it in the upper ranges of golf greens fees in Michigan. By way of comparison, Black Lake is $60 with a cart and the nationally recognized Forest Dunes is $119 with cart. 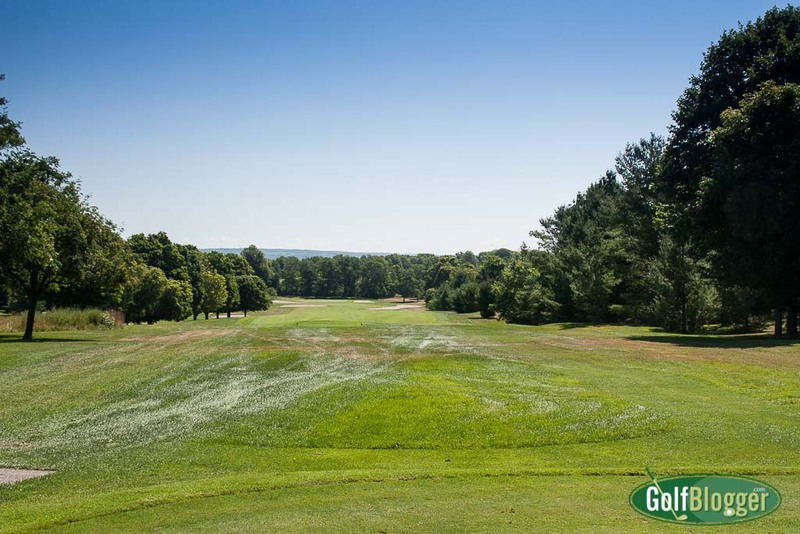 The Belvedere Golf Course Review was first published August 10, 2015. Belvedere's second hole is a 457 yard par 4. Belvedere's Fifth Hole is a 541 yard par 5. The view on the approach on the par five fifth at Belvedere. The sixth at Belvedere is a 383 yard dogleg right par four. The seventh at Belvedere is a 460 yard par 4. The twelfth is a 439 yard par 4 that plays downhill to the green. Belvedere's Thirteenth hole is a 409 yard par 4. Belvedere's fourtheenth is a 200 yard par 3. Belvedere's fifteenth hole is a 465 yard dogleg right. The second shot is downhill. The second shot at Belvedere's fifteenth is from a precipice (marked by stakes) down to the green. A view from behind the green on Belvedere's fifteenth. Belvedere's sixteenth is a 346 yard par four to a steeply uphill green. Belvedere's 17th is a 179 yard par three. Belvedere's eighteenth hole is a 456 yard par 4. I agree with your assessments. I suspect they need $$$ as the value of a membership has diminished with the growth in competition.